Having to reorganise my bookshelves again to make room for some new additions. I should feel bad that I kind of broke my 'read 5 before I buy 1 book challenge', but I can't feel guilty about books - especially when they were on sale! A few chocolate chip cookies with a cup of tea in the afternoons. Sometimes it's necessary! Taking down the Christmas decorations. They're lovely, but they would lose their magic if they stayed up all year round. "I may not agree with what you say, but I will defend your right to say it"
Is there anything or any blogs you have particularly enjoyed this week? Wonderful post Jennie, and I could not agree more with Number 5, just such an awful thing. i could never say no to a few biscuits with a cup of tea any time of day! definitely necessary. :) and you shouldn't feel bad about buying books, though that is a great rule of reading 5 before buying any more. i really need to bring that rule into my own life but when you find one on sale or a book you've been after second hand somewhere you can't turn that down. Look forward to checking out those blogs - there's a few i've not heard of! Haha, yes, I agree, sometimes you just need some chocolate chip cookies. i know how you feel - i have so many TBR books but it is so hard to resist buying new books!! Absolutely love the phantograms! My go-to song is When I'm small. Quite old and listened to it on repeat so many times, but I never get tired of it! I've been loving the blog www.hearting.co.uk this week :) It's always so lovely to find new blogs so thanks for sharing your favourites! I love that last quote! It's always important to allow people to express their opinions- even if you do not agree with them! Oh the eternal struggle of fitting all of the books I love into my home! I swear I will end up one of those old ladies surrounded by teetering piles of books, with her cats sleeping in amongst them... About those Christmas decorations... I have totally just placed the fairy lights in a different place. I am not ready to say goodbye to all the twinkles just yet! I love biccies and tea and completely agree with #5. I definitely need to adopt a 'read 5 before buying 1' challenge.. I was really lucky and received so many for Christmas and my birthday last month but I still went out and bought two more today! you're so right about the christmas decorations! and i also definitely need to be more strict with my erratic book buying habits! sighh i think i really should get around to putting away my christmas decorations too. i've been holding off but you're right i think it's time... thanks for sharing that phantogram song. it's different to my usual music picks but it's so great for a quiet weekend! I still have my Christmas tree up and I know I won't keep it up all year, but one more night of sleeping with the lights and I promise I'll put it back in its box! I just re-ordered my shelf units and I have two whole shelves of unread books. How awful is that! I need to adopt the read 5 buy 1 approach I think. I've also got about 10 dvds of films I need to watch... more being added to my "must-get' list all the time, it's awful I feel like such a consumer! Lovely post! I'm gonna check all those blogs out now! I need to read some more books before I let myself buy any new ones but it's so hard - charity shops are my weakness, I may need to just avoid them haha! Also chocolate chip cookies are sometimes totally necessary. There is always room for books, or at least there should be in everybody's shelves. 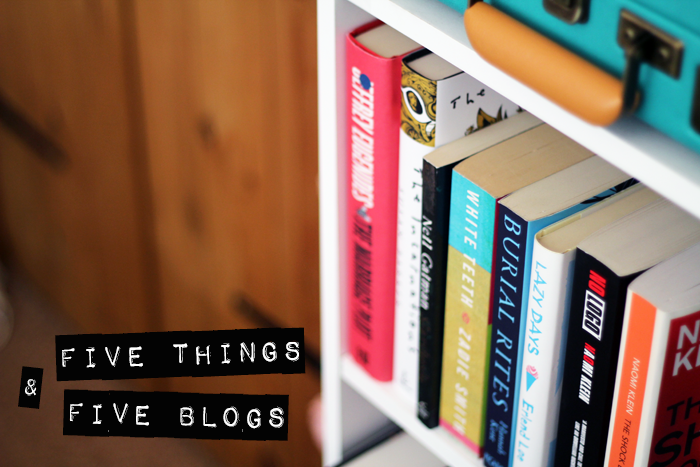 Fabulous blog picks, and you've given me some new reads. So thank you! I have been loving scones with a bit of coffee! I'm terrible for being new books recently! Especially with having a kindle! If I start reading a series and I want to read the rest so many times I've downloaded to my kindle! It's really naughty of me as i never used to kind trawling the shops for books!